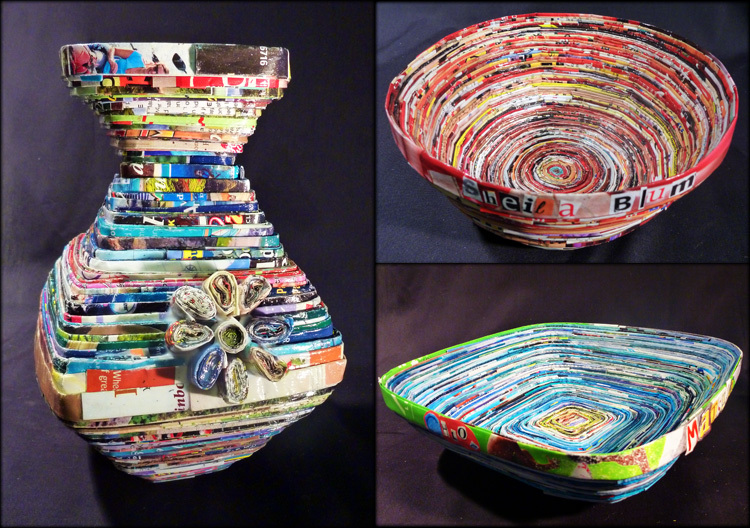 Our most recent crafty Art project was to make a bowl out of folded magazine pages secured with white glue. This project introduced students to creative ways to re-use and recycle old magazines and create something 3-dimensional, functional and beautiful! While the original objective was to create a bowl, several students stretched their imaginations and invented creative forms and unique containers! As an introduction to the layering and 3-D construction process, I shared the contemporary artwork of Japanese artist Haroshi. Haroshi’s skateboard sculptures are similar to the magazine bowl project because they are made from recycled materials (skateboard decks), display colorful layers, and often have a functional purpose. These are so great! Do you have a link that gives the instructions? When I searched for “recycled magazine bowls” I found several sites with instructions, but ultimately adapted them for myself and my students. I found it worked really well to pre-cut magazine pages (I have a stack cutter that helped) and I would get two strips for every page. We discovered how to create different forms through experimentation, trial and error. Just love this project and want to do with my 6 th grade students. Do u have a lesson plan? I don’t have a written lesson-plan, but its easy to find instructions with a quick Internet search. Because folding, gluing and wrapping the magazine layers can be a long and somewhat monotonous process, I spent time in each session teaching about functional art and making connections with utilitarian examples from various cultures times and places. 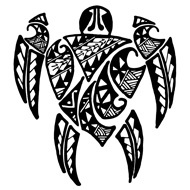 There are also some really neat resources if you search for “recycled art” or “up cycled art”. WOW!!! I love these. I have done bowls for two years with my 8th grade but this is a new twist on it. Thanks so much for sharing. I can’t wait to explore the rest of your blog! Beautiful!!! I’m very impressed by the creativity of the shapes. Can you go into more detail about the pre-cut magazine pages? When you say you get two strips per page, do you mean you cut a magazine page in half? I’m a bit confused about that step. Would the student do any folding? Lastly, what type of glue did they use? Any info would be great. Thank you so much!! To clarify, I cut the magazine strips in half (the long way) using a stack cutter. You could easily do the same thing with a paper cutter, but I would definitely do this yourself or have an adult do it. My students did all of the folding themselves. We practiced step-by-step as a group in the beginning, but it didn’t take long before they were flying solo. We used regular white school glue, and it took A LOT! I purchased the glue in bulk jugs and refilled smaller bottles every couple days. Hope that helps! Thank you so much Julia! Again, great job! I love how the students pushed the envelope with design. Really great work!!! Very impressive! This kind of work makes me soooooo proud to be an art teacher and I thank you for sharing. Your students did a great job!